Like the Southern Cross itself, these stars are visible nearly all year round. The pointers are always visible, while Canopus and Achernar may set below the horizon in the late evening winter southern skies. 1. Canopus—the second brightest star in the sky (after Sirius). It is a white super giant, about 65 times as big as the sun and around 300 light years away. 2. Alpha Centauri—the third brightest star in the sky, although it’s really a trinary system. Two stars of the system are unimaginatively named Alpha Centauri A&B, both Sun-size stars. The third is a red dwarf, called Proxima Centauri, as a result of it being the closest of the system—and the closest star of all—to our Sun. It’s around 4.3 light years away. 3. Beta Centauri—although apparently associated with Alpha Centauri as the second pointer star, it has no real association at all and is over 500 light years away. It’s the tenth brightest star in the sky and traditionally called a binary system, but there is evidence that the largest (primary star) of the widely separated pair may have another very close companion star. 4. 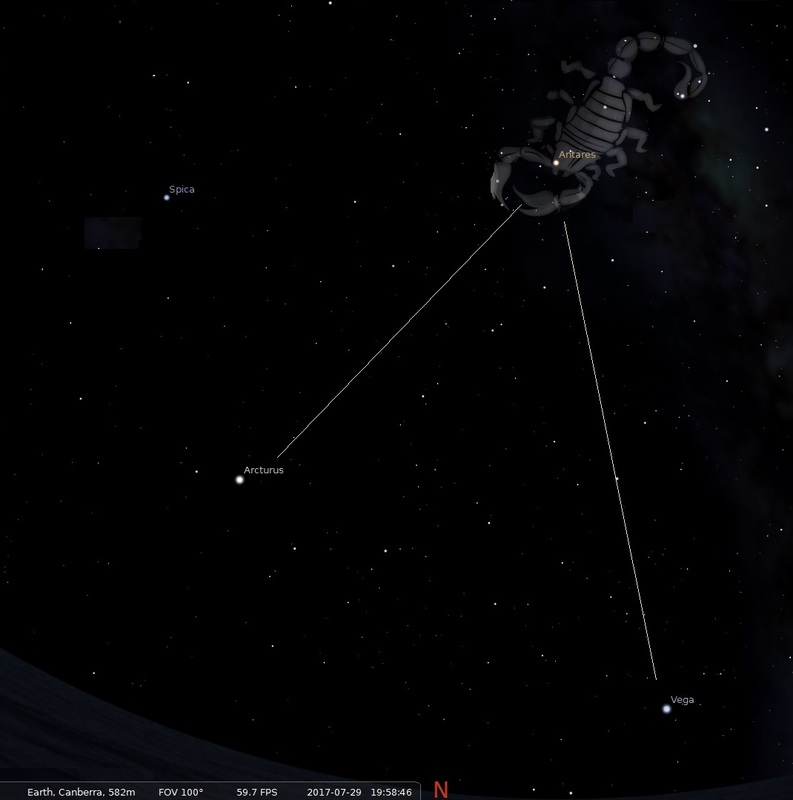 Achernar—is at the other end of an imaginary line drawn through the long axis of the Southern Cross. The eighth brightest star in the sky, it’s around 140 light years away and about 10 times the size of the Sun. Unlike the other stars above, Achernar can dip below the horizon in late evening Winter southern skies. The other stars above more closely circle the South Celestial Pole and are hence visible throughout the year. Like Orion’s Belt itself, these stars are only visible in the late evening southern summer skies. From Orion’s belt – Betelguese is below the saucepan (imagine it’s the red flame doing the cooking) and Rigel is above. A long line to right of the bottom of the saucepan takes you to Sirius, while a long line to the left takes you to Aldebaran (13th brightest star) and then the Pleiades (an open star cluster and worth a look through your cheap binoculars). 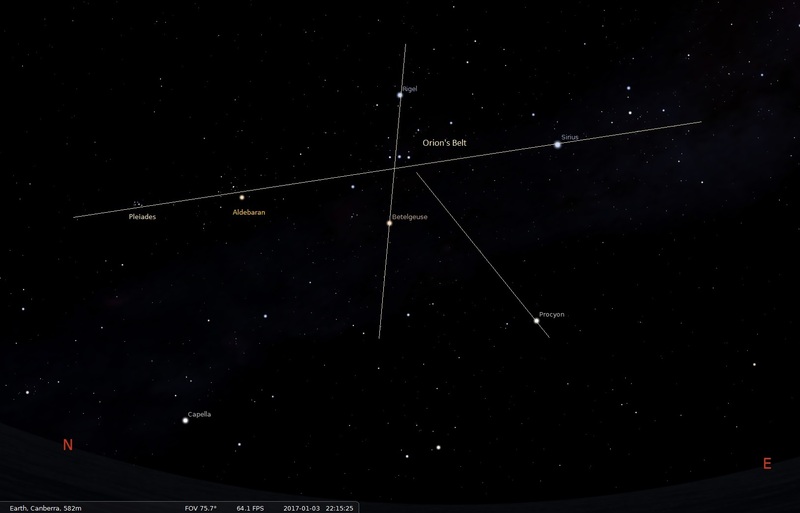 Another bright star, Procyon tracks behind Orion’s Belt as it shifts to the west. 1. Sirius—the brightest star in the sky, mainly due it’s proximity. It’s a binary system of Sirius A (about twice the size of our sun) and Sirius B, a white dwarf. 3. Rigel—is the sixth brightest star in the sky about 800 light years. A bit like Beta Centauri above, it’s traditionally called a binary system, but may be even more complex. Its largest (primary star) is a blue-white supergiant about 70 times the size of the Sun. 4. Procyon—is the seventh brightest star in the sky, a binary system and just over 11 light years away. 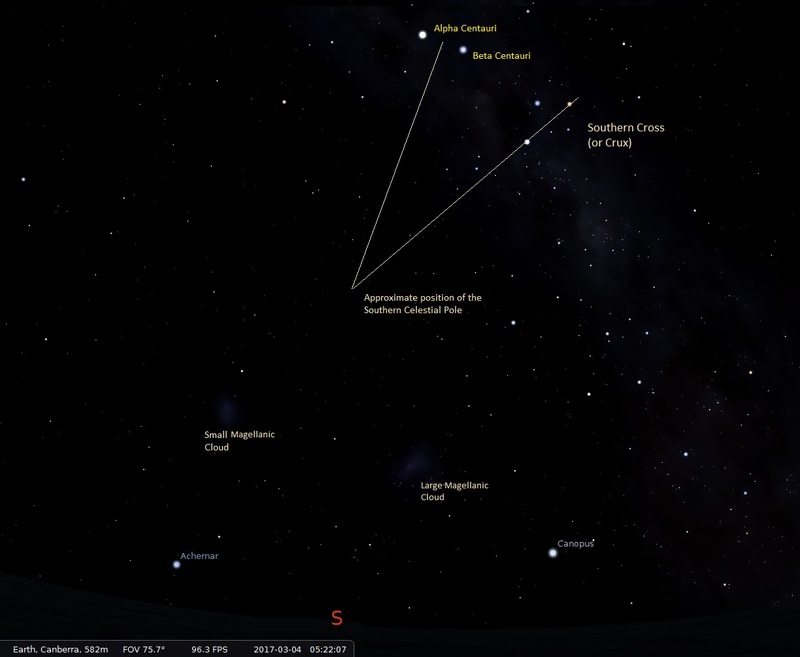 Like Scorpio itself, these stars are only visible in the late evening southern winter skies. These two stars, complete with the other eight stars above, complete the ten brightest stars in the night sky (or otherwise star systems that look like a single star to the naked eye). 1. Arcturus—the fourth brightest star in the sky is only 37 light years away. Its mass is probably not much more than our Sun, but it is 25 times larger being a red giant. Like other red giant stars, it can be worth a look through some cheap binoculars. 2. Vega—the fifth brightest star in the sky and just over 25 light years away. Vega sat more or less on the North Celestial Pole at about 12,000 BC. However, due to the precession of the Earth’s axis, the celestial poles have shifted such that Polaris is currently the northern pole star. By 14,000 AD—Vega will once again be able to be called the northern pole star. This is because both celestial poles shift (‘precess’) around a circular path a period of 25,765 years. The South Celestial Pole shifts in the same fashion, although there has never been an officially identified southern pole star.